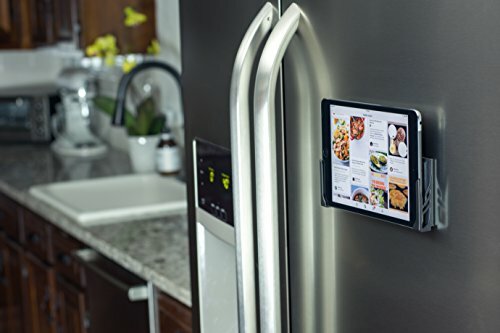 The Koala Tablet Wall Mount 2.0 is a more versatile upgrade to our best selling Koala Mount. 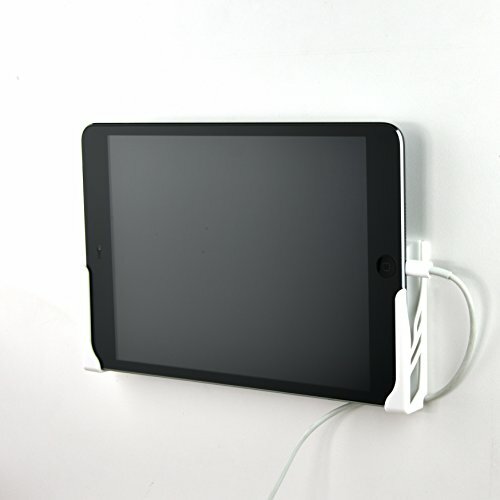 It provides an excellent combination of aesthetics, functionality, and affordability in a tablet mounting system. 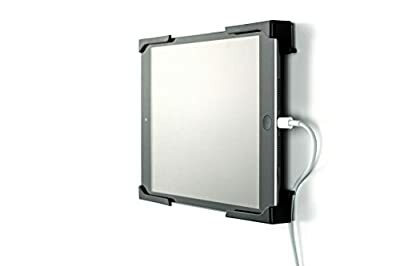 Perfect for storing, charging, and viewing your tablet or smartphone in the kitchen, bedroom, gym, bathroom, office, or anywhere else around your home, apartment, dorm, or office. HOW IT WORKS: The Koala Mount 2.0 consists of two small, sturdy plastic brackets that are set up on the wall independently, allowing you to space them as needed for your specific device and orientation. 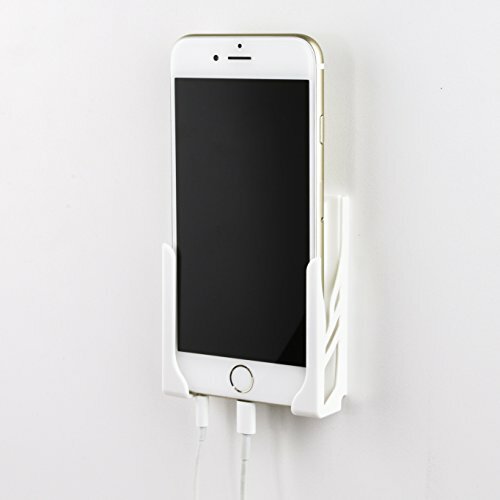 The 2 brackets gently cradle your device, which rests in the pocket created, utilizing gravity to hold it in place. 2 MOUNTING OPTIONS: Designed to mount with screws or Command adhesive strips (both included). Command adhesive strips allow for a damage free setup and removal and require no tools, while screws and anchors are ideal for more heavy-duty needs. SPACER PADS INCLUDED: The Koala Mount 2.0 comes with spacer pads designed to discreetly fill extra space between your device and the brackets, creating a tighter fit. COMPATIBILITY: Any device/case combination that is 13 mm thick or less will fit into the Koala Mount. Some thicker devices will also work if the edges are thinner. PORT ACCESSIBILITY: Designed specifically to leave as much access to ports as possible. Measure your device and compare to the dimensions image to determine if the ports you need will be accessible when mounted. Consider mounting upside down or switching between portrait/landscape mode if necessary for port access. EASY IN AND OUT: There's no fussing with clamps, springs, or latches with the Koala Mount 2.0. Simple, one-handed use. PACKAGE CONTENTS: 2 ABS plastic brackets, 2 self-drilling drywall anchors, 4 screws, 2 Large Command strips, surface prep pad, 8 spacer pads, instructions. 2 SETUP OPTIONS WITH INCLUDED PARTS; Incredibly simple, damage-free setup with 3M Command Adhesive strips rated to hold up to 5 lbs each, or setup with included screws and anchors for scenarios where a more heavy duty setup is required. WIDE RANGE OF COMPATIBILITY: Uses 2 separate brackets that you can set at whatever distance required for your device, allowing for wide compatibility. The brackets will fit any device 13mm thick or less, although some thicker devices/cases may also fit if they have tapered edges. In many cases, can be used with protective cases left on (if total thickness is under 13mm). ACCESSIBLE PORTS: The Koala Mount 2.0 was specifically designed to leave as much space open as possible on the sides and bottom of the device so that most ports will still be accessible, depending on your device. For example, even with an iPhone 6 mounted in portrait mode, the headphone jack is still accessible. BUILT-IN CORD CLIPS: There are 2 different styles of cord clips integrated into each bracket. The side clip is a temporary clip that is super easy to use and is meant for holding your cord while the mount is not in use. The bottom clip is a semi-permanent clip designed to hold your cord at all times. MAKE IT PERMANENT: If you are looking for a secure, permanent mount from which a device cannot be removed, you can use 2 sets of Koala Mount 2.0 brackets to lock in a device by attaching the 2nd set of brackets with Command strips.